The world may have been in an economic depression, but one never would have known that listening to the music being made in 1930. 1930 Headlines … Worldwide Great Depression worsens … Radio mystery program The Shadow debuts … Construction is begun on the Boulder Dam (Hoover Dam) … The BBC begins regular TV transmission in U.K. 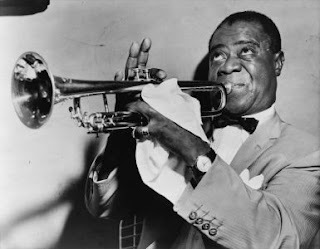 This is the second recording Louis Armstrong made of W.C. Handy’s classic “St. Louis Blues.” The first was a slow, heartfelt recording in 1925 with Armstrong on cornet and blues great Bessie Smith on vocals. This version is every bit as brilliant, but that is where the comparison stops, because the two sound nothing alike. 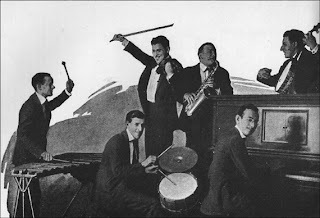 Armstrong takes the same Handy melody as a starting point, but creates his own unique interpretation of it: he speeds it up, adds exotic percussion and jazz instrumentation, and improvises like mad. Not only does he add his own unique spin to the melody, but he throws the original lyrics away and starts over from scratch. He sings lines like, “I believe in my soul my baby’s tryin’ to quit me,” but there is no trace of melancholy. Instead, Armstrong’s vocals are as exuberant as his trumpet playing. And his trumpet playing is phenomenal, especially in the song’s final minute where Armstrong abandons the original melody all together and soars into the stratosphere with some unbelievably joyous improvisation. It is nothing less than we have come to expect from him, but for the mainstream audiences who were just starting to pay attention to him, this must have been quite a revelation. The first record released under just Armstrong’s name was actually a duet with pianist Earl Hines. It was recorded in Chicago in December 1928 but not issued until nearly two years later in October 1930. Compare it with other any other jazz record made during this time, and you’ll see why: this is revolutionary stuff that did not easily fit into the rest of Armstrong’s cannon. Armstrong is as impressive as ever, but he actually plays it fairly straightforward. It is Hines that steals the show, as he turns all previous notions of jazz piano inside out, sounding like nothing that had ever been heard before. 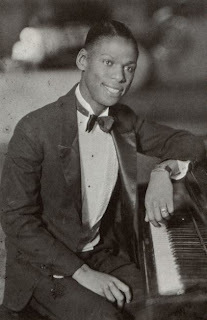 We had been given some glimpses into Hines’ revolutionary style in his previous work on Armstrong’s Hot Five recordings, but not to this degree. He sounds twenty years ahead of his time, as he plays fast and loose with the tempo and bangs out a series of what at times sounds like completely random notes. Despite the perceived chaos, however, there is a method to Hines’ madness and it all fits together brilliantly. For example, listen to his solo about half-way through, where his two hands seem to be playing two different songs, and at times even two different tempos, but they somehow come together again just before Armstrong re-enters. Its complexity makes “Weather Bird” a challenge to listen to, but also a delight. This is where modern jazz begins. This song was written in 1929 and first recorded in November of that year by Leo Reisman and His Orchestra (Victor 22221), soon after the Black Tuesday stock market crash that marked the start of the Great Depression. Popular band leader Ben Selvin had a big hit with it the following year, and Franklin D. Roosevelt revived it as his Presidential campaign theme song in 1932. It is an enjoyable piece that captures its time well. The lyrics paint an unabashedly sunny picture: “Your cares and troubles are gone / There'll be no more from now on.” However, the singing in Selvin’s version is very reserved and mostly sticks to the lower registers, suggesting a cautious optimism. The instruments are also mostly toned down, although there are a few showy flashes, which become more pronounced toward the end, finishing the song on a high note. Fred Astaire’s first claim to fame was his marvelous dancing, which he expertly displayed in many of Hollywood’s biggest musicals. He also had a pleasant singing voice that helped him score several chart hits, including this classic Irving Berlin number. Most of Astaire’s better known hits were sung in a sweet, “crooning” style, but this record is fiery by comparison. 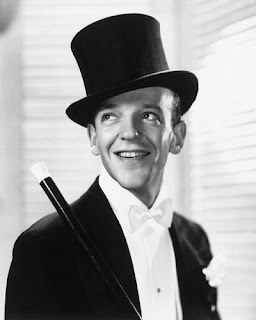 Not only is the instrumentation feisty, but Astaire proves himself adept at jazz singing, with loads of expression and a swinging approach to timing. The tap dancing interludes are also well done, the tapping syncing nicely with the bouncing rhythm section. Incidentally, this is the first recording on this list made outside of the United States: Astaire cut this record while on tour in London in March 1930.